When Band Hero was announced, we were a bit taken aback. The name alone was confusing, diluting the Guitar Hero brand by blending it with that of the biggest competitor, Rock Band. The biggest emphasis of the game's marketing has been Taylor Swift's inclusion, as well as the decidedly pop focus of the game's music. We've had quite a bit of fun at Band Hero's expense here at Co-Optimus, joking about the art style, song list, and obvious appeal to teenagers. What are we to expect from Band Hero, then? Is it a carbon copy clone of Guitar Hero, just another attempt by Activision to flood the game shelves? Or is it a kid-friendly, Top 40 music game that holds its own compared to other games in the genre? The answer lies somewhere in the middle. 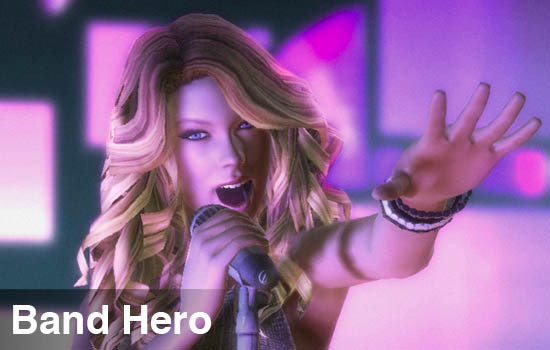 Band Hero is, for all practical purposes, almost exactly like Guitar Hero 5. The menus, the gameplay modes, the career progression, challenges for each song, are identical to Guitar Hero 5. 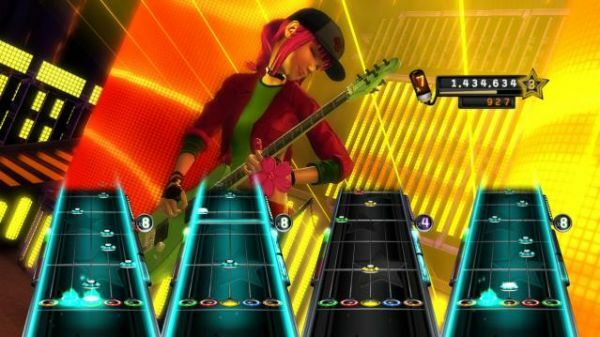 Everything, as far as the game engine itself is concerned, is taken directly from Band Hero's predecessor . "Party Play" is here, and with it the drop in/drop out, mix-and-match instruments play that works so wonderfully for.. well, you know, parties. Whether or not this similarity to the previous game is good or bad depends on how much you enjoyed Guitar Hero 5. As far as co-op is concerned, Guitar Hero 5 was a strong effort, and Band Hero is similarly solid. There's not much innovation at all, but why mess with what works? The most obvious difference between Band Hero and Guitar Hero 5 is the art style. There are sparkles and healthy doses of pink and purple everywhere. Neon and spotlights cover every inch of the various venues, which include a shopping mall and outer space. (No, I'm not kidding.) Even the Guitar Hero characters have been totally revamped, and are far more glamorous than ever before. I was totally shocked to see the long locks of Axel Steel had been replaced by one of those short, spiky, haircuts; you know, the type that look like they have been carefully formulated to look as if the owner just got out of bed. This change is a good representative of the style of Band Hero. There is nothing retro, vintage, or old school about it; everything is new, shiny, and very modern. The song list is very much the same way. While there are a few classics, the overwhelming majority of the songs are recent pop music hits. Artists like the aforementioned Taylor Swift, Nelly Furtado, Aly and AJ, and Hillary Duff are certainly a new direction for music games, that's for sure. A few classic pop songs from the likes of Culture Club, Devo, and Duran Duran are included, and they are certainly fun to play, if not exactly bringing to mind the head banging roots of the genre. A smattering of songs are here that would better have fit into Guitar Hero 5, such as 3 Doors Down's "When I'm Gone", Papa Roach's "Lifeline", and "Every Rose Has Its Thorn" by Poison. In my opinion, the song list had way too much fluff in it (get off my lawn!) but for others, that might not be the case. Clearly, Band Hero is supposed to be the pop series, and Guitar Hero, rock; if a handful of songs were swapped between the two games, I think both would have fit this model and been better as a result. In any case, the value of the song list is totally subjective, and you'll have to decide whether it's good or bad for yourself. Page created in 0.2774 seconds.